There are strict time limits on when a wrongful death case may be filed or pursued in Washington State. This time limit is called the Statute of Limitations. 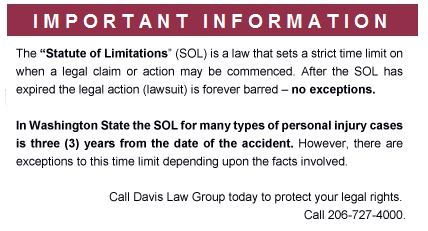 In Washington State the Statute of Limitations is usually three (3) years from the date of death. This means that the case must either be settled or filed in court within this time or the claim is no longer valid. Not only is it a dangerous practice to wait until the end of the three-year period before filing suit or settling the claim, but most wrongful death cases should be investigated immediately following the person’s death. Given the potential size and complexity of this type of case, the insurance company will almost always mount an immediate investigation and aggressive defense of the claim. You certainly want to be prepared for this. You also want to promptly gather evidence to make sure the claim is preserved. This may include gathering witness statements, performing an accident reconstruction, obtaining a private autopsy, and hiring experts, if necessary. In many cases, a prompt investigation can dramatically increase the likelihood of a successful outcome in a wrongful death case. Although most wrongful death claims must be filed in court within three (3) years of the date of death, this time period may be shorter in certain situations. For example, if the death was caused by negligence that pre-dated the person’s death (for example, the person was injured and then survived for a period of time before dying) then a case may need to be filed within three (3) years from the date that the negligence was committed. Again, you should immediately consult with an experienced wrongful death attorney to learn whether a shorter time limit may apply to the case.